After almost three exemplary years at the helm, Sunday Creek watershed coordinator Kaabe Shaw has accepted a position with the Ohio Department of Natural Resources (ODNR) Division of Mineral Resources Management. He will be working out of the Athens office. Although I am pleased to see Kaabe further his professional career, his departure will be a loss to the Sunday Creek Watershed Group and to Rural Action. Since 2006, Kaabe has managed the Sunday Creek office. Prior to his employment with Rural Action, Kaabe worked as an urban conservationist with the Franklin County Soil and Water Conservation District. Having held the position of watershed coordinator at Duck Creek in Noble and Washington Counties, Kaabe was familiar with the duties and responsibilities of managing watershed activities. Kaabe is a graduate of the Ohio Watershed Academy and has OEPA certifications as a Certified Data Collector for Qualitative Habitat Evaluation Index (QHEI) and Water Chemistry. 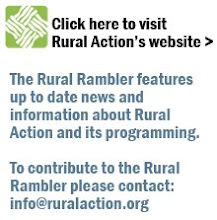 Kaabe has been an asset to Rural Action. He has always been on hand to help with fundraising events and other activities. His input and willingness to share his talents have helped strengthen the capabilities of our watershed team. We wish Kaabe well as he begins work to help other impacted streams. If you see him around Athens, thank him for all he has done for the Sunday Creek Watershed Group and Rural Action.